A new version of a criminal justice reform proposal could grant early release to many fentanyl dealers, the Washington Free Beacon has learned. Although the latest version of the FIRST STEP Act does exempt certain fentanyl traffickers from being released early, loopholes evident in a copy of the text obtained by the Free Beacon mean that many distributors of the deadly synthetic opioid could still go free. Such language appearing in the final bill language could spell trouble, as a failure to exempt fentanyl traffickers in a previous version helped cement President Donald Trump's opposition to it. FIRST STEP is a bipartisan proposal to reduce the size of the federal prison system and increase exposure to rehabilitative programs. It would use a system of "good time" credits to shorten federal sentences, releasing as many as 4,000 federal prisoners early. However, after passing the House of Representatives, FIRST STEP stalled out in the Senate. This was thanks to concerns about, among other things, what kind of prisoners were excluded from receiving good time credits. Specifically, drug traffickers were eligible for early release unless "death or serious bodily injury resulted from the use" of the drug they had sold. The possibility of mass-releasing drug dealers did not fly with Trump, whose opposition sank the bill's chances of a floor vote before the midterm. In a meeting before he came out against the bill, Trump said he would never support a bill that set fentanyl traffickers free, and agreed with then-Attorney General Jeff Sessions that Congress should toughen fentanyl sentencing guidelines. Backers, responding to Trump's concerns, have put together a new version of FIRST STEP, expected sometime early this week. Koch Industries V.P. and general counsel Mark Holden, who has been a key representative for the bill in the media, told the Washington Post that he expects that text to receive an up-or-down vote during the lame duck session. The new version of the bill ostensibly excludes fentanyl dealers from receiving the sentencing reductions, a change that was central to it receiving the backing of the Fraternal Order of Police (which did not respond to a request for comment for this article). "The FOP played a key role in making sure that truly dangerous offenders, like those who commit crimes while armed and those who traffic in deadly narcotics like fentanyl, are ineligible to participate in the First Step program," said FOP President Chuck Canterbury in a statement on his group's support of the bill. But the text of the bill, as seen by the Free Beacon, does not categorically exclude any person convicted of selling fentanyl from early release. Rather, it specifically excludes individuals convicted of manufacturing, distributing, or possessing with intent to distribute fentanyl and its analogs if and only if they are also found to have been an "organizer, leader, manager, or supervisor of others in the offense." This language comes from the "role adjustment" sentencing modification that certain offenders can receive for playing leadership roles in drug trafficking schemes. Data from the U.S. Sentencing Commission indicate that just 7 percent of all drug trafficking offenders received any kind of "aggravating" role adjustment, of which the leader adjustment is just one example. In other words, the overwhelming proportion of individuals who might be charged for trafficking fentanyl are not organizers, leaders, manager, or supervisors—and all of these people are still included in eligibility for FIRST STEP's sentence reduction. Additionally, the new version of the bill adds only fentanyl and its analogs to the list of drugs the trafficking of which would exclude certain people from release. A person convicted of trafficking other drugs, like heroin and cocaine, can still get out early. However, fentanyl is rarely, if ever, trafficked by itself. Rather, it is usually mixed with counterfeit prescription pills, heroin, or cocaine, meaning that individuals who traffic in these drugs may very well also be fentanyl distributors. 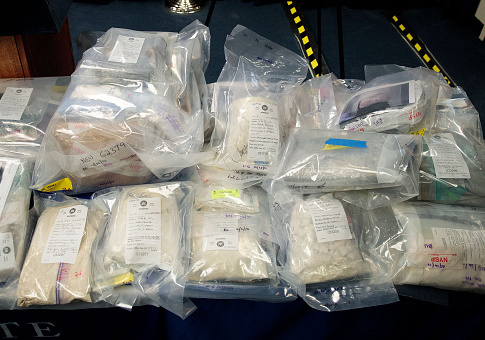 While heroin or cocaine trafficking is often also fentanyl trafficking, most federal drug trafficking offenders are not convicted of actually trafficking fentanyl. This is because it is much easier to identify heroin or cocaine, as opposed to fentanyl, which requires a lab test to confirm. This helps explain why 93 percent of all federal drug offenders are incarcerated for drugs relating to cocaine, heroin, marijuana, or meth; few if any are actually convicted of fentanyl distribution. All of this means that the actual language included in the revised version of FIRST STEP is unlikely to do much to forestall the early release of fentanyl dealers—an eventuality that would lead to more deadly fentanyl on America's streets. The bill's specific exclusion of only certain fentanyl dealers—and inclusion of all other drug dealers—is not popular with the public. A survey commissioned by the National Association of Assistant U.S. Attorneys found that 74 percent of respondents would oppose "a proposal to reduce penalties for traffickers in heroin, fentanyl, and similar drugs." This entry was posted in Issues and tagged Department of Justice, Donald Trump, Drugs. Bookmark the permalink.